He was an Indian teacher, philosopher, economist and jurist. Notable work: Arthashastra, Chanakya Niti. Chanakya was an Indian teacher, economist and a political adviser. He played a key role in the establishment of the Maurya dynasty. He is also known as Kautilya or Vishnu Gupta. He was born in ancient India, 350 BC. His birth place is a subject of controversy. Some believes he was born in Taxila and some says he was born in South India. Though he was a Brahmin he had all the capability to rule a kingdom. He was not good looking but he had tremendous knowledge. He began his search for a true king when Dhanananda, the king of the Nanda dynasty insulted him and thrown him out from the kings court. Chanakya understood that Magdha was in vulnearable state under the leadership of Dhanananda. His search for a powerful and true leader ended when he met Chandragupta Maurya. Chandragupta was a young boy (about 12-13 years old). Chanakya taught him about ruling and warfare. Later they ended the Nanda dynasty and established Maurya Dynasty. Chandragupta became the first king of Maurya Dynasty and Chandragupta became his prime minister. Under the guidance of Chanakya, Maurya Empire became the largest empire of that time. 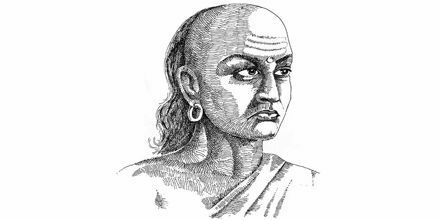 Chanakya was born in a Brahmin family in 350 BC. The details regarding the place of his birth are unclear. According to the Jain writer Hemachandra, Chanakya was born in the Chanaka village of the Golla region, to Chanin and his wife Chaneshvari while other sources claim that his father’s name was Chanak. He was educated at Takshashila, an ancient centre of learning located in north-western ancient India (present-day Pakistan). He grew up to be a well-read young man, with knowledge in a variety of subjects including economics, political science, war strategies, medicine and astrology. It is also believed that he was familiar with elements of Greek and Persian learning. He was fully knowledgeable concerning the Vedas literature too. After completing his education he became a teacher (acharya) of political science and economics at Takshashila. Takshashila, (later corrupted as Taxila), one of the topmost centers of education at that time in India became Chanakya’s breeding ground of acquiring knowledge in the practical and theoretical aspect. The teachers were highly knowledgeable who used to teach sons of kings. It is said that a certain teacher had 101 students and all of them were princes! The university at Taxila was well versed in teaching the subjects using the best of practical knowledge acquired by the teachers. The age of entering the university was sixteen. The branches of studies most sought after in around India ranged from law, medicine, warfare and other indigenous forms of learning. The four Vedas, archery, hunting, elephant-lore and 18 arts were taught at the university of Taxila. So prominent was the place where Chanakya received his education that it goes to show the making of the genius. The very requirements of admission filtered out the outlawed and people with lesser credentials. Chanakya authored the treatise ‘Arthashastra’ which discusses a variety of topics such as monetary and fiscal policies, welfare, international relations, and war strategies in detail. The text is believed to a compilation of the works of various authors by some scholars. The ‘Arthashastra’ also explores issues related to the nature of government, law, civil and criminal court systems, ethics, economics, markets and trade, nature of peace, and the duties and obligations of a king. Topics such as agriculture, mineralogy, mining and metals, animal husbandry, medicine, forests and wildlife are also covered in the treatise. Chanakya is the author of Arthashastra and Chanakya-Niti. Arthashastra is a book on Economics. The policies discussed in the book are still relevant. Chanakya-Niti is a collection of aphorisms. Chanakya was died in 283 BC. There are many versions of stories regarding the death of Chanakya. Some says that after his retirement he went to jungle and died there. Some says that he was died because of the conspiracy of Subandhu, a minister of the Bindusara’s court.